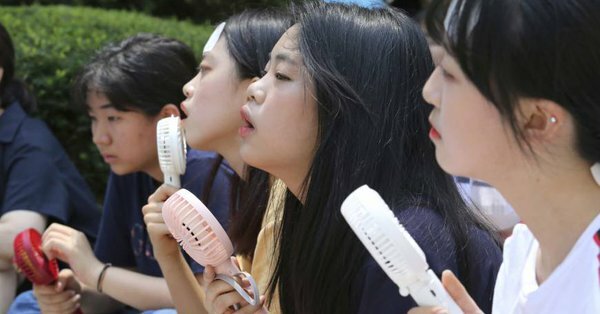 42 people have died of heat-related illnesses in South Korea as the country endures a record heatwave with temperatures not felt in more than 100 years. This, in fact, marks the highest number of deaths since the nation started officially counting casualties due to heat in 2011. Officials also said that since the end of May more than 3,400 people have been treated for heat-related illnesses such as heatstroke. The country has been grappling with extreme temperatures since late last month. Temperatures in capital Seoul have reached a scorching 39.6 degrees Celsius (103 Fahrenheit) just last week, making it the hottest temperature recorded in 111 years. Seoul is the most populous area in the country, being home to half of the country’s population. The extreme temperatures have severely affected the crops across the border in North Korea, a country that has often faced food shortages. Unfortunately, most of the casualties were elderly and poor people who lack air conditioning in their homes. In order to cope with the emergency situation and unprecedented conditions, the government has decided to cut electricity prices for July and August so citizens will use air conditioner more and other energy-intensive appliances. The government is also planning to revise laws to include extreme heat as a form of natural disaster so victims can avail of compensation for heat-related deaths or illness.